From the Alps and Dolomites of northern Italy to Mount Etna on Sicily, Italy offers many opportunities for skiing and winter sports vacations. Most ski resorts also make good summer hiking and climbing vacations, too. The Italian Dolomites, bordering Austria, offer spectacular mountain scenery and a number of Italian skiing villages. Because of the height of some of the mountains, it's possible to ski nearly year-round in some places. The Dolomites are good for beginners or advanced skiers and offer other winter sports as well. Ortisei is a great place for cross-country skiing. 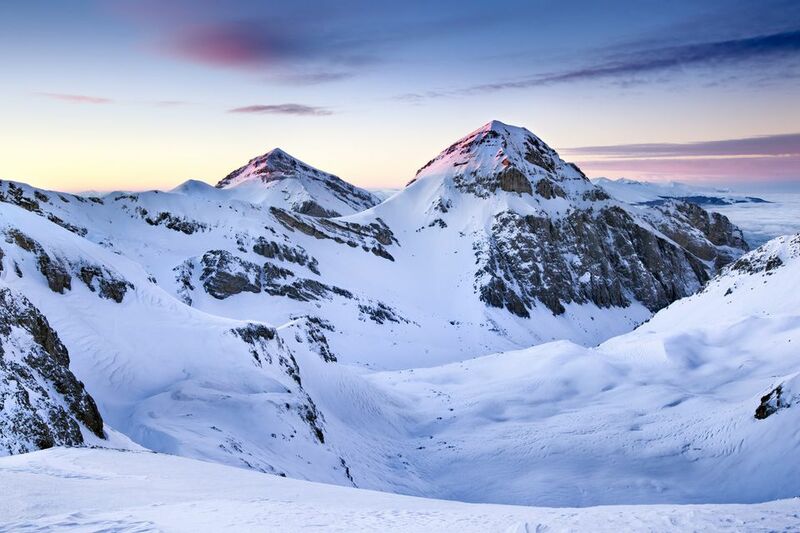 Cortina d'Ampezzo and Val Gardena are two of the most well-known ski areas. The Dolomites are listed as a UNESCO World Heritage Site. Cortina d'Ampezzo is in the Italian Dolomites in the Veneto Region of northern Italy, 451 km from Milan-Malpensa Airport. Cortina d'Ampezzo is one of Europe's most exclusive resorts. Surrounded by beautiful scenery, the picturesque village makes a beautiful place to ski and to visit, but it is very expensive. The village has a museum and art gallery, movie theater, indoor tennis, restaurants, and hotels. There are 47 ski lifts and skiing is best for beginners and intermediates. The resort is at a height of 1224 meters and the top ski elevation is 3248 meters. Other winter sports include tobogganing, bobsled, ice skating, and ice hockey. The ski area of Val Gardena is high in the Dolomites and has hosted World Cup skiing events. Val Gardena is part of the huge Sella Ronda circuit and has 80 lifts with a ski range of 1563 to 2518 meters, promising plenty of snow. It's best for intermediate skiers. The resort village of Selva Gardena is at 1563 meters and has a large number of restaurants, ice skating, and indoor sports activities. Near the Swiss border and the Swiss ski resort of Zermatt, the village of Cervinia, in Valle D'Aosta, is at the base of the Matterhorn or Monte Cervino. Although the village is not as charming as Zermatt, it is less expensive, has great Italian food, and you can drive to the village, unlike in Zermatt where no cars are allowed. Excursions can be easily made to Zermatt. Cervinia has a casino, restaurants, swimming pool, ice skating, movie theater, and shops. Cervinia is 2050 meters high and is 124 km from Turin Airport and 184 km from Milan-Malpensa Airport. Cervinia has a run over 20 km long, one of the longest in the world. Because of heavy snowfall and high elevations, there is skiing nearly all year. Skiing is best for intermediate skiers. More advanced skiing can be found nearby in Zermatt, Switzerland. The highest ski elevation is 3480 meters and there are 30 ski lifts. Courmayeur, also in Valle D'Aosta, is on the opposite side of Monte Bianco (Mont Blanc) from Chamonix, France. Cormayeur is a traditional alpine village in a fantastic location with great scenery and is known as one of the best all-around ski resorts in Italy. The village offers great shopping and good Italian restaurants and lively nightlife. Courmayeur is at a height of 1224 meters and is 153 km from Turin Airport and 214 km from Milan-Malpensa. Courmayeur and Chamonix share the highest mountain peak in Europe. Peaks higher than 4000 m dot the horizon, providing snow most of the year and some challenging skiing. The highest ski elevation is 2763 meters and there are 16 ski lifts. Although skiing is best suited to intermediate skiers, there are some advanced runs and more advanced skiers can cross the border into France. Courmayeur is also a popular destination for climbers and hikers in the summer and early fall. The Piemonte (Piedmont) Region, in northwest Italy, offers skiing and mountain sports in the villages that hosted the 2006 winter Olympics. You can ski where the Olympic skiers competed. The mountains of Piedmont also provide many winter sports, peace and quiet for amateurs to have fun, space for beginners, and great cultural and gastronomic traditions. Piedmont has 53 ski resorts and 1300 km of runs. Read about Piemonte villages and what they offer in Ski Piemonte and locate the winter sports villages on our Piemonte Map. Skiing is found on Mount Etna, Sicily's volcano and the highest point in Sicily at 3350 meters. Mount Etna often gets deep winter snows and offers 1400 meters of vertical skiing but some lifts were destroyed in volcanic eruptions. There are two ski areas on Etna, the southern slope is Rifugio Sapienza and the northern ending in the resort of Linguaglossa. Hotels, instruction, and ski rentals are available in both areas. Mt. Etna is reached from nearby cities of Catania and Taormina.